This post is dedicated to the unflappable, those of you who prefer (read, insist on) to be called by your name. Whatever that name is, but mostly for those who don’t prefer nicknames. This is for the Katherines (all variant spellings), Eugenes, Jennifers, Jeffreys, Jacquelines, Williams, Elizabeths, and even the Leahs, Cynthias, Roberts, Lawrences, Henrys and Edwards. A few years ago, I found out my name – and its derivations (Gwyneth, Genevieve, Geneva, Guinevere) – means “pure at heart.” While I’m flawed, I basically am pure at heart. I generally do what I say I’m going to do, and I make commitments and speak with sincerity. 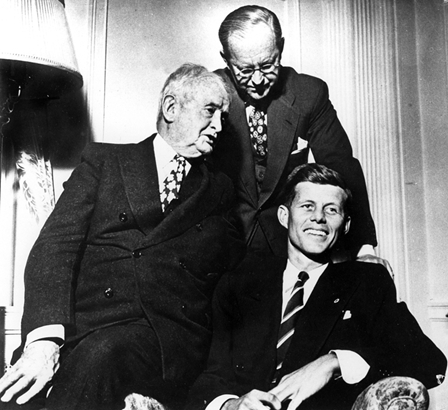 Thus, I prefer all nine letters of my name be used when I’m addressed: G-W-E-N-D-O-L-Y-N.
A family of nicknames: John F. “Jack” Kennedy, right, father Joseph P. “Joe” Kennedy, center, and grandfather John F. “Honey Fitz” Fitzgerald. I wasn’t always that way. Before I found out what my name meant, I actually hated having such a long name. I recall being jealous of classmates with short names, as we all learned to write ours. Geeeeee … dou-ble-U … E … en … dee … oh … el … Y … en. By the time Suzy wrote her Y, I was still writing my W. I always was the last one to finish writing my name, and I decided as I got older to never use the full name. Few people called me Gwendolyn, my grandmother among them. Surely, there’s some logic as to why we insist on shortening names, and recently I learned there are even words for that, depending on what we choose to cut. Apocope is the word for dropping the ending of words, so that’s when Gwendolyn becomes Gwen. When Eugene becomes Gene, that’s called aphaeresis. Clipping the beginning and end of words, such as when Elizabeth becomes Liz, is called middle clipping, but I’m sure a more convoluted word exists to define it. The bottom like of this is we’re a nickname society. We somehow feel OK in calling people by names of our choosing or not taking care to pronounce someone’s name. Some people are OK with it, but others may be offended, so be careful. And it’s not just long names like mine. I understand how Maurice can become Mo or Reese and how Daniel can become Danny or Dan. But, how does John become Jack, or Henry Hank? Then, there are just downright mispronunciations. How many syllables in Leah? Actually, that one depends on the person. I know at least three women who have that name. Two pronounce it with two syllables (as in LEE-Uh), and one pronounces it with one syllable (as in Lee). Since I’ve been using all three syllables of my first name, it’s amazing how many strangers want to shorten the name, something that bothers me, as I tend to call people by the name they use when introduced. I’m also amazed at how many ways my last name can be mispronounced. If a guy introduces himself as Michael, I’m going to call him Michael, not Mike. So, if I introduce myself as Gwendolyn, I expect the same. Once, a student called me unprofessional because I corrected her when she clipped my name. Hmm. Shouldn’t I have the right to correct the use of my name, as long as I’m tactful? Nowadays, I can tell how long someone has known me just by what they call me. I don’t correct those who have known be since before I could speak. I don’t correct folks who have known me since before I discovered what my name means. I’ve learned that the best way not to call someone by the wrong name is to ask what they prefer to be called … and then call them that.